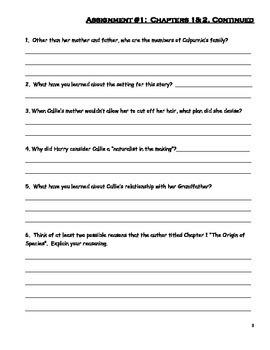 This is a ready-to-use, 37 page novel study for students in grades 5-8 as they read the 2009 Newbery Honor Book, The Evolution of Calpurnia Tate, by Jacqueline Kelly. It includes a 23 page student booklet designed to reinforce essential reading, writing, and thinking skills for the young teen. Common core standards are supported in the skills and include summarizing, explaining, visualizing, connecting to the text, inferring, citing evidence from the text, general comprehension, understanding point-of-view plus author's purpose, and expanding vocabulary. An answer key is provided. The student booklet is divided into eight reading assignments (about 40 pages per assignment) with questions and activities that go with each assignment. Individual student booklets may be created by copying and give three staples to the left side. Additionally, the teacher has the option of handing out desired pages as they are needed rather than creating a booklet. The booklet is designed for independent work so that students may be working on this in class while the teacher is meeting with another group. 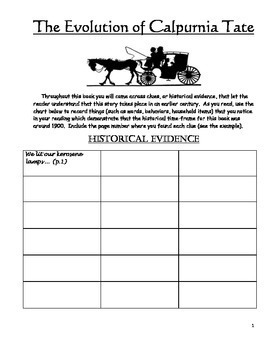 Students could also be given these assignments as homework. In my class, students would meet once a week with me (or an aide or a parent), along with the other students reading the same book (we called this a "book club meeting") to discuss the book and review the assignments. Created by Jean Martin. This is Jacqueline Kelly's first novel and was awarded a 2009 Newbery Honor! It takes place in 1899 and provides the reader with a window on daily, small town life in Fentress, Texas at a time when the telephone and automobile are about to change lives dramatically. We learn how life was lived before the many luxuries that have become an integral part of life in the twenty first century. Calpurnia is a lively, down-to-earth, nearly-twelve-year-old girl who is becoming passionate about science and nature in a way that most of her friends and family don't quite understand. Thanks to her grandfather, she is learning that she can become whatever she wants in life and is struggling to determine just what that is. The reader becomes so attached to this endearing girl that when the last chapter ends it is like saying good-bye to a good friend. Appropriate for students in grades 5-8. Reading level approximately 6th grade. Challenging vocabulary.